Examples of Synfig-made animations and stills can be found in various places, including our website, and in a dedicated examples package released under the terms of GPL V3. 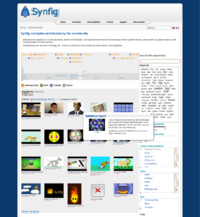 Many topics, techniques and ideas have been explored over time by the community of Synfig users. Many creators were keen enough to share the source files of their art work for your own inspiration. You can find it in our examples repository. Please do check the licensing terms before reusing in other work.